No matter what way Vietnam follows to develop rice production and export, the way must ensure two things – the benefits for farmers and the stability of the rice trade. What will be the world market like in 2013? 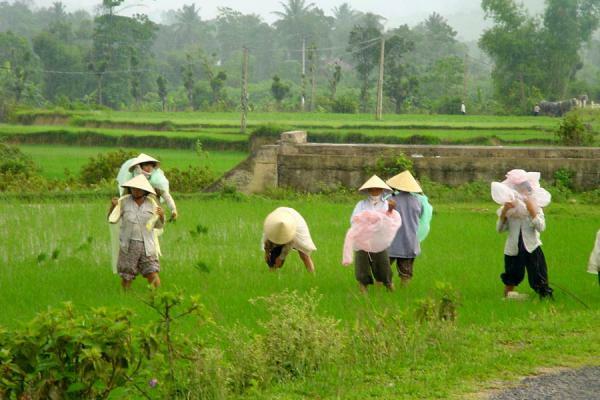 The Vietnam Food Association (VFA) has warned about a difficult year for rice export in 2013. In fact, 2012 was also an unsatisfactory year for Vietnamese rice exporters. Vietnam exported 7.72 million tonnes of rice, worth $3.5 billion, representing an increase of 8.2 percent in quantity, but a decrease of two percent in value. Where do Vietnam’s rice products stand in the world market? According to the Food and Agriculture Organisation (FAO), Vietnam’s 5 percent broken rice was traded at $412 per tonne in December 2012. The price was higher than that of India and Pakistan. However, Vietnam’s rice was cheaper than Thailand’s which was traded at $583 per tonne. Especially, Indica rice from Hubei province in China was traded at 3,900 yuan in September 2012, or $625 per tonne. Meanwhile, Vietnamese experts believe that there would be no big changes with Vietnam’s farm produce in 2013, which means that the more rice Vietnam produces, the biggest loss it will incur. In such circumstances, there are three choices for Vietnam. First, Vietnam would follow the way being followed by India, which sells low quality rice at low price and tries to sell as much rice as possible. If it chooses that way, it is the farmers growing rice who would suffer. The government has stated that it would apply necessary measures to ensure the 30 percent profit at minimum for rice farmers. However, farming still cannot support their lives, even though the rice they put out has been exported in big quantities, and at very low prices. More importantly, experts said, with low quality and low price rice, Vietnam would not be able to build up a strong brand for Vietnamese rice. The second choice for Vietnam is to follow Thailand, which is selling high quality rice at high price. However, this would also be thorny path to follow, because Vietnam is not a strong rice brand at all, while Vietnam still has to compete with cheap rice from India and Pakistan. Especially, in the current conditions, consumers tend to choose low cost products to be full up, instead of high quality products. Thailand has lost Hong Kong and Chinese markets to Vietnamese and Indian enterprises, which should be seen a big lesson for Vietnam. The third scenario will occur if Vietnam can conduct all the phases of the rice production process, from production to export, in a harmonisation. It would also need to join forces in seeking partners and negotiating export contracts so as to optimise their export profits. Prof Vo Tong Xuan, who is considered the leading rice expert in Vietnam, when talking about the low-price Vietnam’s rice, emphasized that there is one principle to follow: the export prices must bring benefits to the nation and to farmers, who account for 70 percent of Vietnamese population. In order to ensure benefits for farmers, Vietnam should strive to sell high quality rice to make profit – like the purpose of Thailand. However, it needs to follow a special way which allows implementing its strategy effectively. Xuan believes that after Thailand announced the rice price increase of 50 percent, Vietnam should also increase its export prices. Thai rice exports in 2013 are expected to fall for the second year to an estimated 6.5 million tonnes, due largely to strong market competition and thin demand, according to the Thai Rice Exporters Association. This is far lower than the 8.5 million tonnes projected by the Commerce Ministry. Low demand from major buyers China, Indonesia and the Philippines, and higher demand for rice from Vietnam and India, were to blame for the decline, association president Korbsook Iamsuri said. Thai rice exports dropped sharply by 35% to 6.9 million tonnes in 2012 and exporters put blame on the state's rice pledging policy, which paid over-the-market for pawned rice and meant the Thai crop was less competitive on the global market. HO CHI MINH CITY, Feb 6 (NNN-VNS) -- The Viet Nam Food Association (VFA) has announced new floor prices for rice exports that will take effect on Feb 6. The minimum export price for five per cent broken rice will go up to US$410 per tonne from the current prices of about $390 per tonne, while 35 per cent broken rice will be exported at no less than $365 per tonne. The fixing of floor prices is to encourage rice exporters not to set lower prices since the prices of Vietnamese rice was now $30-40 lower than that of Pakistan and Indian rice, the association said. The VFA has called on rice exporters to strictly adhere to floor prices, adding that they can decide on their own prices for other varieties. In January, rice export fell in both volume and value over last year, the association said. Exporters shipped 404,095 tonnes for a free-on-board (FOB) value of $183.4 million, a reduction of 35.68 per cent in volume and 36.94 per cent in value over December in 2012. The average FOB price during the period was $453.95 per tonne. VFA chairman Truong Thanh Phong said rice prices at the end of last month fell by $20-30 per tonne compared to the end of December due to low demand in the world market and stiff competition among rice exporters. In January, VFA members signed contracts to export 1.24 million tonnes of rice, and delivery of 637,000 tonnes have to be made this year on contracts signed last year. This meant another 1.4 million tonnes of the grain (in addition to the 404,095 already sent in January) have to be shipped in the first quarter, he said. Currently, VFA member companies are buying rice under a plan to buy one million tonnes from the winter-spring crop to support farmers, Phong said. The Myanmar Commerce Ministry expects the volume of rice export will hit the highest in 60 years with metric tonnes of 1.5 million for this year. Myanmar rice has been exported over 1.2 million metric tonnes within ten months of this fiscal year 2012-13. The ministry hopes to export another 300,000 metric tonnes before the closing of this fiscal. Myanmar measures April 1 to March 31 as the country fiscal year. Myanmar rice exporting has been down after 1956. Before that year, Myanmar exported average over one million metric tonnes annually. Last year Myanmar exported about 800,000 metric tonnes and this year export volume has increased to almost two-fold. The ministry said, as of today, Myanmar earns US$500 million from rice export for this year and expects to be over US$600 million when the fiscal year is ended this March. Myanmar will increase the export volume incoming years to meet the high demand of Japanese and European buyers. Myanmar is exporting with the price of US$400 per tonnes for rice. Despite the high record for the country, Myanmar export volume is still down on the list compared to regional countries. Thailand has been exporting average over 10 million metric tonnes of rice annually followed by the Vietnam with 7 million tonnes a year. India, the world’s largest producer of aromatic basmati rice, may miss a target to boost exports 25 percent this year as a rally in domestic prices curbs demand from buyers in Europe and theMiddle East, a trade group said. Shipments of the grain, which can fetch about double the rate of traditional white rice, may total 3.5 million metric tons in the year ending March 31, less than the 4 million tons forecast in August, M.P. Jindal, president of the All India Rice Exporters’ Association, said in an interview on Jan. 28. Exports were 3.2 million tons in 2011-2012, he said. Prices in India rallied 38 percent this year after the government raised rates for the non-basmati variety to a record, potentially hurting earnings at exporters such as KRBL Ltd. (KRB), Kohinoor Foods Ltd. (KFL) and LT Foods Ltd. (LTFO) Farmers may boost planting to benefit from the surging cost of the grain used to make dishes including biryani and pilaf, potentially doubling the harvest and increasing exports, said Vijay Setia, a former president of the association. The average price of basmati has climbed to $1,100 a ton from $800 a year earlier, said R.S. Seshadri, a director at Tilda Riceland Pvt., a New Delhi-based exporter. Benchmark 100 percent grade-B Thai rice costs $616 a ton. Shares of Kohinoor fell 0.3 percent to 29.80 rupees, while KRBL climbed 5.4 percent to 26.60 rupees in Mumbai today. Basmati paddy production may double next year from 5.7 million tons in 2012-2013, Setia said. Exports were 2.5 million tons in the nine months ended Dec. 31, compared with 2.2 million tons a year earlier, he said. India controls 65 percent of the overseas basmati market, according to the state-run Agricultural and Processed Food Products Export Development Authority, while Pakistan, the only other main producer in the world, accounts for the rest. The aromatic rice variety, specific to a geographic region, is cultivated in the states of Haryana,Uttar Pradesh and Uttarakhand in India, and in Punjab that straddles both the South Asian countries. Saudi Arabia and Iran are two major buyers of Indian basmati. The U.S., Europe and Africa also purchase the grain. India’s rice exports including the non-basmati variety, are set to to drop 23 percent to 8 million tons in 2012-2013 from 10.4 million tons in 2011-2012, according to the U.S. Department of Agriculture. Production may fall to 99 million tons from 104.3 million tons, according to the agency. Vietnam may become world leader this year in rice export. Production of the paddy crop misses official targets. A rice field in Laos, Sept. 22, 2011. Laos’s rice production has fallen short of government targets for the second year running due to natural disasters and a seed shortage, dealing a potential blow to the Southeast Asian nation’s ambition of becoming a rice exporter. It produced 2.70 million tons of rice in 2012, 10,000 tons short of the official goal, according to official figures. The figure marks a decline in total rice production for the second year in a row. An agriculture official said Laos had missed the 2012 target because the country lacks seed to distribute to farmers and farmers are uninformed about the best cultivation methods. “Laos was not able to produce enough rice to meet the target because of a lack of seed, and in particular because farmers do not understand how to use the seed correctly, which reduces the quality of the rice yield,” he told RFA’s Lao Service, speaking on condition of anonymity. “Floods were another factor, mostly in the low-lying areas along Mekong River,” he said. Most of the country’s rice comes from the lowland areas, which can support cultivation during both the wet and dry seasons, while upland areas rely on irrigation. Laos is aiming to produce 4.2 million tons of rice by 2015 and turn itself into a rice exporter alongside its neighbors. Population growth has triggered greater demand in recent years for the staple grain in Southeast Asian and world markets, creating the possibility for Laos to export rice within the region. Last year, it announced plans to join neighboring Vietnam, Cambodia, Burma, and Thailand in establishing a rice exporting cooperative aimed at gaining leverage on the international rice market. A report by the Asian Development Bank predicted Laos will be able to shift its status from rice importer to a minor rice exporter over the next decade if it can maintain current grain production and consumption growth rates. But the U.S. Department of Agriculture has warned that Laos faces considerable constraints for future rice production, including limited arable land suitable for rice cultivation, a vastly underdeveloped irrigation capacity, and extreme underfunding for agricultural crop extension programs. In order to raise the growth, Laos has plans to devote more land to rice cultivation, raising the current 821,000 hectares to over 1 million hectares. A majority of Laos’s agricultural land is devoted to the crop, with an average rice production capacity of 1.76 tons per hectare. But large swathes of rice paddy land are also being turned over to property development, sparking concern that better management of agricultural land is needed to protect the country’s food security, the Vientiane Times newspaper reported Thursday. Although last year’s 2.7 million tons of rice produced fell short of target, it came closer to the mark than the year before. In 2011, which saw severe floods and droughts, Laos produced 2.9 million tons of rice out of a targeted 3.64 million, according to official figures. Some indications on the organisations' programmatic future may also be found in the statements of one of its first promoters, Mr. Ngô Van Tân (poet Tan Van). In early 2005 he wrote an article in which ae promoted the Ideology of Rice Power in Vietnamese language Manh Vì Gao (Rice Power). He paid special attention to the hardship of peasants in rice producing and exporting countries facing price pressures from international buyers In another article appearing in the Vietnamese newspaper Saigon Tiep Thi on May 30, 2007 he suggested Vietnam and other rice exporting countries to establish an organization called OREC in order to make rice price "reasonable" and supply stable, thus creating a win-win situation for both buyers and producers. The alternative would discourage farmers from production, thus causing future shortage. The same article appeared again in various Vietnamese newspapers and websites on March 30, 2008. Ngô Van Tân also promoted the idea of using a portion of profits from rice trade to fight food shortages in poor areas, a form of food redistribution that make the world more fair and just. 'I have talked with Myanmar and invited them to join the rice exporting countries cartel, which will include Vietnam, Laos and Cambodia, to form the group,' Samak told reporters. Myanmar's Prime Minister General Thein Sein, in Thailand for an official visit, has agreed to join the group, even through the military-ruled nation is not currently a large rice exporter, he said. 'Thailand will help them in terms of technical support to improve their production for export,' Samak said. Vietnam, Laos and Cambodia have also agreed to join, and Thai Foreign Minister Noppadon Pattama said OREC should begin meeting soon. Thailand is the world's largest rice exporter, shipping an estimated 9.5 million tonnes of rice overseas last year. The analysis below identifies top rice importing regions from around the world. South America … 1.1 million tons (3.9%). Even though Asia farms more than 91% of the global rice harvest, Far Eastern nations import more rice than any other continent. Rice deliveries to the following 10 countries rose the fastest in 2004 from the prior year. Canada … 334,320 tons (up 26.3%). The 10 nations below decreased their milled rice imports the most in 2004. Russia (Europe) … 618,460 tons (down 4.1%). Organisation of Rice Exporting Countries (OREC). 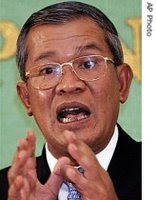 across the region and the world," Hun Sen said. "When there are shortages, we will not stockpile the rice or increase prices," the premier said. "We really want to help ensure food security." We all need to do our part to reduce poverty, prevent further environmental erosion, and ensure a prosperous future for the billions of people in Asia’s rice societies. Contributing to the Asia Rice Foundation is to invest in a healthy work force and a green environment. What you do today will make a difference in Asia’s tomorrow. Show you care—get involved. This organization is unique and has common aim to increase rice production and exportation. Thanks to it, rice supply and demand will harmonize, price will be stabilized and beneficial to both consumers and producers. As you know that peansants in exporting countries have suffered with unreasonably low price in the past, many peasants in Vietnam, Thailand and Cambodia lived in poverty for their hard work, had to sell their daughters in order to survive because rice farming was a money loosing usiness that made many of them in debt lifetime! In the meantime, low rice price was a factor in wasting this essential product in many cities especially in North America if you go to a Chinese restaurant, a lot of cooked rice (often overserved) left over by customers was thrown in garbage. In the meantime people in Asia and Africa starved because of rice shortage. Thanks to reasonable price, rice peasants can benefit and therefore continue to produce actively instead of quitting the farm, thus guarantee undisrupted supplies. As a humanitarian person by nature, I also suggested that those farmers and their exporting countries reserve a portion of profit to pool together to help subsidize poor people worldwide so they can afford this essential product. PHNOM PENH - An organization of rice exporting countries (OREC) including Thailand, Cambodia, Vietnam, Laos and Myanmar will aim to set common price for their rice exports for more benefits of their own and the world, national media said on Monday. A Common price for rice will enhance OREC's capability to produce rice, provide a chance to help settle the world food crisis and increase the incomes of farmers, Chinese-language newspaper the Commercial News quoted Cambodian Minister of Agriculture and Fisheries Chan Sarun as telling a rural products exhibition in the southern province of Takeo on Sunday. For more than half of humanity, rice is life. It is the grain that has shaped the cultures, diets, and economies of billions of people in Asia. For them, life without rice is simply unthinkable. Between now and 2020, 1.2 billion new rice consumers will be added in Asia. Feeding these eople will require the greatest effort in the history of agriculture: rice production must be increased by one third from today’s 320 million tons to 420 million tons. Farmers will have to grow an extra 3.7 million tons every year—at the very time that rice land is decreasing and the remaining fields eem to be wearing out. Today, there is barely enough rice for everyone. And in some places, because of political and economic turmoil, there is not enough—and people are going hungry. If we do not begin to respond to today’s cries for help, Asia’s future will be bleak. Growing more and more rice from less and less land, however, may simply not be sustainable. Chemical pesticides are already polluting the lakes, rivers, and groundwater. Genetic biodiversity is eroding, salinity is encroaching farther inland, and there is less water for irrigation. Air and water pollution are already problems in many places. What kind of environment will our children inherit? Grown in Asia for at least 10,000 years, rice has richly influenced the cultures and lives of billions of people. In the old societies of Asia, rice dictates the rhythm of life. It is the grain that links Heaven and Earth, gods and mortals. Throughout the region, rice dominates customs, beliefs, rituals, and celebrations. But as societies become affluent, they are slowly becoming less attached to rice. And the death of an elder often means the loss of age-old traditions and legends. Who will preserve the priceless rice heritage? How do you find our website? Copyright © 2019 OREC. All Rights Reserved.